Several plans and attempts were made to build the railway from Guayaquil to Quito, from 1860 until 1874, when the first locomotive reached Milagro. But it was only in 1895, when Eloy Alfaro was president, that contacts were made with North American technicians Archer Harman and Edward Morley, representatives of an American company interested in the building of the "most difficult railway in the world" as it was called at the time. An agreement was reached, and "The Guayaquil and Quito Railway Company" started the construction in 1899. The tracks finally reached a huge obstacle - an almost perpendicular wall of rock - called the "Devil's Nose". Many lives were shed in the building of what now is called a masterpiece of railway engineering: a zig-zag carved out of the rock, which allows the train, by advancing and backing up to reach the necessary height to the town of Alausi. The train finally reached Alausi by September 1902 and Riobamba by 1905. From this point on, the construction was easier. 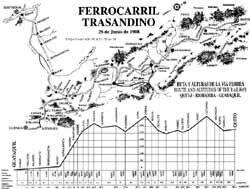 The highest point of the roure - Urbina (3640 m) was reached by the end of 1905 and finally on June 25, 1908 the train made a triumphal entrance to Quito and was received by arches of palms, laurel and flowers, bells tolling, bauquets, dances and popular festivities that lasted for days. the highest point, and Riobamba (2750m) with a historic high speed ride on an ancient railroad maintenance cart. 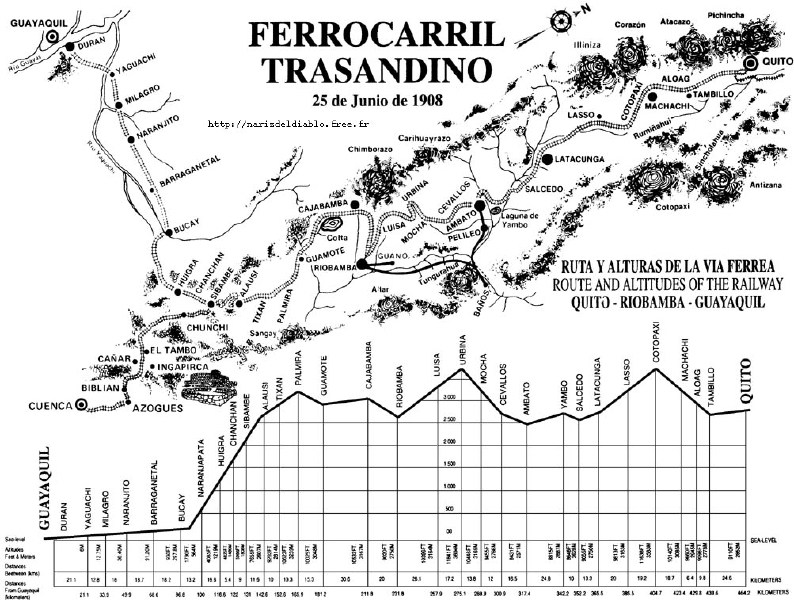 Eight people including three Medical Doctors, a fighter pilot , a steel man, a train engineer, the expedition leader and the owner of the open railroad cart completed the 25 mile (42 km) run in 42 minutes for an average speed of 35 mph (58 km/hr) and an altitude loss of 2919 ft (890 m). This is believed to be a new speed record for any portion of the Trans-Andean Railroad. The people of Riobamba celebrated in the streets (as they do everyday) after the completion of this successful run. Later that day the President of Ecuador hailed the event as a "truly stupid stunt by the joint Ecuadorian / Gringo team".